The guttering on any building is designed to take away any excess water from the property so any blockages need to be cleared regularly. Over time moss, leaves, grit and dirt all go into the guttering and these will block the gutters which in time will cause considerable damage to your property such as leaky roofs and water damage. It's an essential job that needs to be done for the correct maintenance and infrastructure of your home. Gutters and down pipes are an essential part of every buildings weatherproofing & waterproofing system. They ensure the safe run-off of water from the property, protecting the outside surfaces and foundations from any possible water damage. It is possible for a blocked gutter to cause a whole host of issues. Water and debris blocked in the gutter can gather so much weight that the gutter is dragged away from the building's fascia. Backed-up water can also cause leaks to occur within the property and unsightly staining on the outside surfaces. Regular gutter cleaning will prevents these problems. 3 Flow has the equipment and knowledge to carry out this task. Don’t put your home or business under risk by ignoring such a simple & quick cleaning task. More importantly don’t put yourself or any family members at risk by climbing ladders. 3 Flow recommend that you have your gutter cleaned at least twice a year, in autumn and spring. Properties with many trees in the near vicinity will need more frequent cleanings. 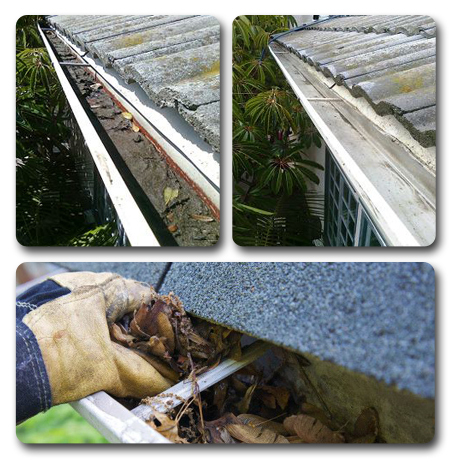 If you see any signs of overflow or water damage 3 Flow recommend that you have your gutters cleaned immediately. Whether you’re enquiring about a one-off service or contractual maintenance plan, call 3 Flow today on 07880798531 / 01482 802323 for a free quote and see how we can help you with your gutter cleaning problems.